I am a huge fan of Courtney Summers and her ability to write incredibly real and flawed characters. Her books always make me cry and feel a myriad of emotions while reading. So when I heard that her next book was going to have zombies, I had absolutely no idea what to expect. Zombie stories are usually humorous, or just full of insanely violent zombie fighting, and I couldn't figure out what angle this story was going to take. Let me tell you, this book is classic Courtney Summers brilliance. Yes, this book has zombies and there are acts of violent zombie fighting, but this book is not about the zombies. This book is about the characters, what they've gone through and what they are currently going through. I have to say, this is the most beautifully written and deeply layered zombie story I have ever read. I loathed, I cringed, I cried, I hoped and cried some more. Well done, Courtney, well done. The story is told from Sloane's perspective. 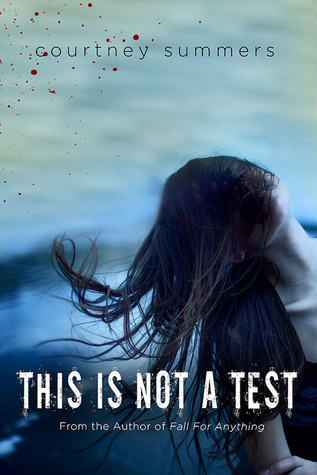 Sloane has a lot of secrets that have nothing to do with the current zombie apocalypse. She's very guarded and apprehensive, and we can tell right from the beginning that she doesn't exactly want to be holed up with the group of kids from her school, waiting for help to come. Despite her desire to just give up, she feels like she owes it to the rest of them to keep acting like she's hoping they will all be saved. Not everyone in their group gets along and they are pretty much divided down the middle. Cary has sort of taken charge of the group and is the reason they have gotten as far as they have, but a tragedy that happened along the way, has made him the enemy of Grace and Trace. Trace is tired of following Cary and begins challenging his every move. Rhys has sort of attached himself to Sloane, but after witnessing some things, he's not so sure he wants her around at all. All of these teenagers are trapped inside their high school, under the worst circumstances imaginable, and the story that unfolds from that is so amazing. I didn't expect to be so deeply invested in a story with a zombie backdrop, but I really shouldn't be surprised, because Courtney Summers never fails to knock it out of the park. Everyone needs to run out and get this book as soon as they can. It will knock your socks off and you won't be sorry! This book was my first Courtney Summers book and subsequently I went out and started stalking her other books and now I own Cracked Up to Be, which I plan on reading soon. Great review, because I agree, this book is absolutely amazing! This is such a beautiful review. Absolutely every review I've seen of this book has been raving; it just sounds so extraordinary, this zombie novel that's so much more. Only Courtney Summers could add that much depth to a story about flesh-eating corpses. I'm so glad you loved this. I really want to read it. It sounds wonderful, and I really need to FINALLY read a Courtney book. I have her first though, and I plan to read it, but when I buy books, they tend to get pushed to the bottom of my HUGE tbr pile.